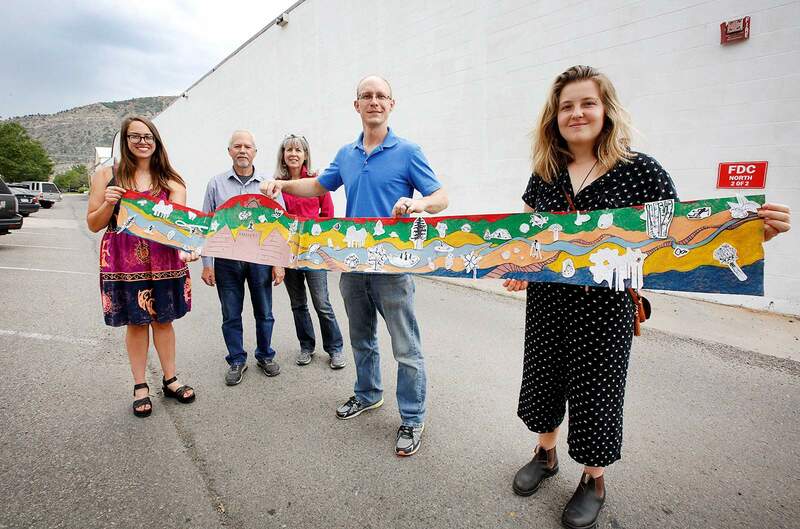 Durango artists Hayley Kirkman, left, creative arts and special projects coordinator for Local First, Matthew French-Holt, center, and Lexis Loeb hold a sketch of the mural planned for the east side of Kroegers Ace Hardware. Joel and Margie Krueger, owners of Kroegers, are pictured in the background. The mural is part of the nonprofit Local First Creative Arts Initiative. The Local First Creative Arts Initiative plans to start work Friday on a mural on the east side of Kroegers Hardware. This mock-up shows the some of colors and images that will be used, but not all of the details have been included in this digital rendering. 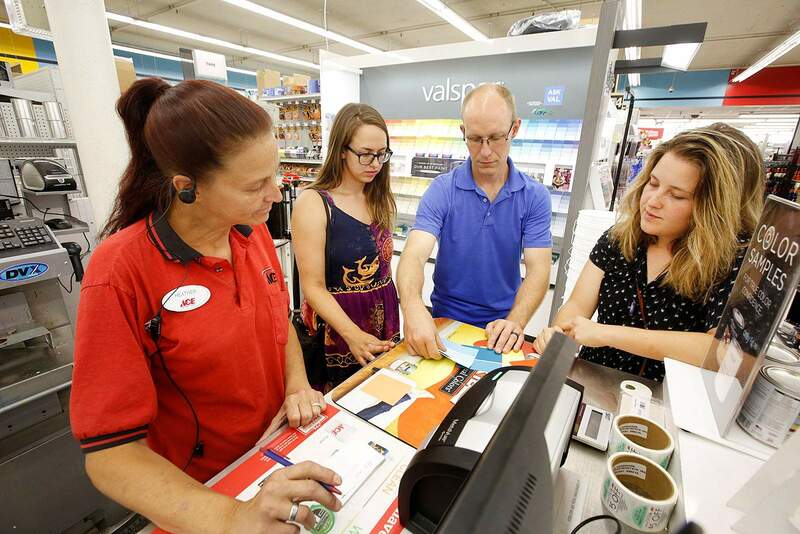 Heather Smith, left, with Kroegers Ace Hardware, assists Durango artists Hayley Kirkman, near left, Matthew French-Holt, center, and Lexis Loeb with paint this week. The artists are preparing to paint a mural on the east side of the Kroegers building. The mural is part of the Local First Creative Arts Initiative. Kirkman is also the creative arts and special projects coordinator for Local First. 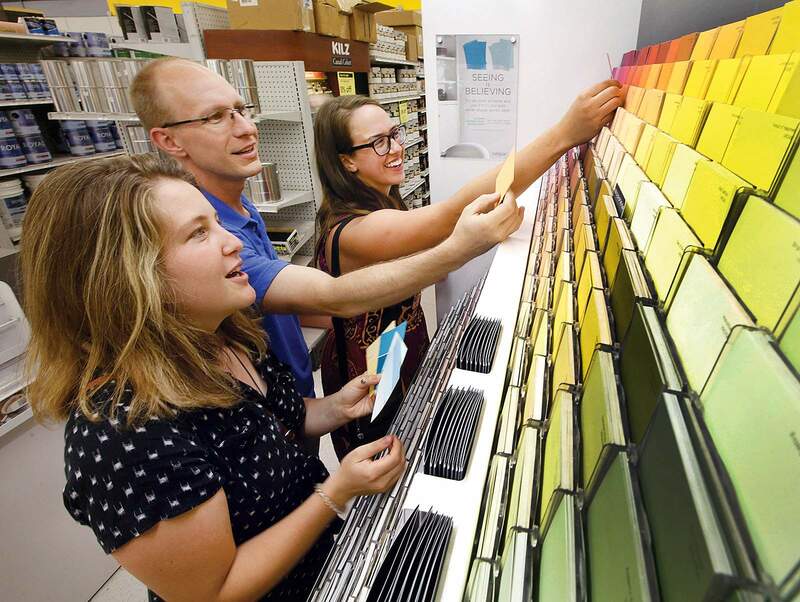 Durango artists Hayley Kirkman, right, creative arts and special projects coordinator for Local First, Matthew French-Holt, center, and Lexis Loeb pick out colors this week for a mural they will paint on the east side of the Kroegers building in downtown Durango. The mural is part of the nonprofit Local First Creative Arts Initiative. Artists will begin work Friday on a grant-funded mural on the east side of the Kroegers Hardware building in downtown Durango. The mural will depict black and white plants, animals and humans on a landscape depicted in southwestern colors. Native floral and fauna, such as aspens, columbine flowers, elk and black bears, will dominate the foreground. Human figures will be depicted participating in some iconic Durango activities, such as hiking, biking and fishing in the background, said Hayley Kirkman, creative arts and special projects coordinator for Local First. “What we really wanted to place importance on was the environment in which we do these things,” she said. The human figures will be blocky stick figures in a nod to ancient cave-style paintings, she said. Kroegers approached Local First about doing a mural as part of the nonprofit’s Creative Arts Initiative. The initiative works to connect Local First business members with the creative arts community to beautify commercial areas. “People naturally want to go shop at businesses that have more attractive art and design,” she said. The initiative also works to provide local artists with living wages and to encourage the arts community in Durango. Kirkman and fellow artists Lexis Loeb and Matthew French-Holt plan to work with volunteers from the community, including youth groups, on the 300-foot-long piece in coming weeks. They expect the background will take shape first. “We’re going to start with bright stripes of color, and that itself will be really striking,” she said. The city of Durango’s Public Arts Commission granted the project $5,000 through Durango Creates!. The city’s Creates! program is in its first year and supports community beautification projects or events along north Main Avenue and around Camino del Rio. “The Public Art Commission was excited about the partnership between local nonprofits, businesses and youth. This art project will highlight local creative talent and transform a blank wall into an attraction,” said Colleen O’Brien, the city’s business development and redevelopment coordinator. Kroegers, Town Plaza Merchants Association and other businesses also sponsored the project. Do you support the painting of a 300-foot landscape mural on the back of the Kroegers Hardware building?